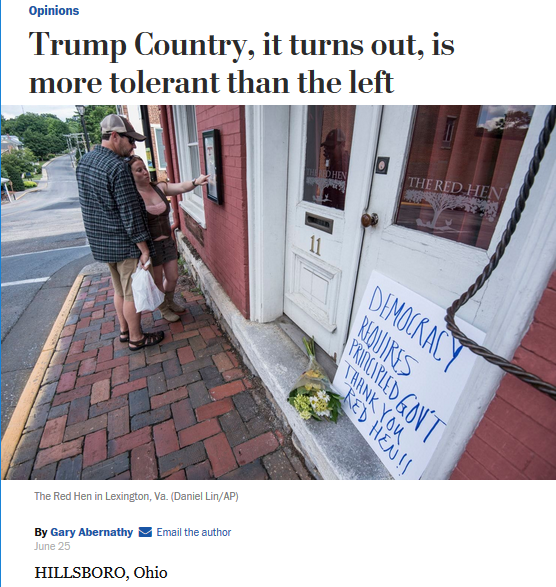 The Washington Post‘s Gary Abernathy (6/25/18) claims “Trump Country…is more tolerant than the left”—ignoring the massive spike in hate crimes that followed Trump’s election. 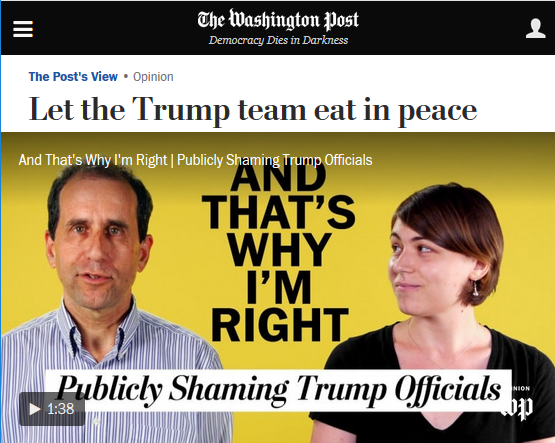 The Washington Post ran three articles between Sunday, June 24, and Monday, June 25, calling for “civility” and criticizing those who interfered with the dining experiences of Trump administration officials. In the highest-profile case, workers at the Red Hen in Lexington, Virginia, decided not to serve White House press secretary Sarah Huckabee Sanders over the government she represents’ discrimination against transgender people and its policy of separating children from their parents at the US/Mexico border. designed to justify and even encourage harassment, intimidation and — then what? The rising McCarthyism of the left will soon lead to the money question: Are you now, or have you ever been, a member of the Trump coalition? When civility prevails among the politically active, it spills over into calm and normality for everyone else; where you shop, or dine, or go to the movies doesn’t have to be a political statement. Commercial establishments are, in that sense, safe spaces. Opposition to what’s called incivility is opposition to resisting the extreme injustices of the present moment. A Post editorial (6/24/18) highlighted this point: The editors say they are against much of the Trump government’s actions and rhetoric, but “we nonetheless would argue that Ms. Huckabee, and Ms. Nielsen and Mr. Miller, too, should be allowed to eat dinner in peace”—referring to Stephen Miller, one of the architects of the policy of ripping apart families. The editorial worried about the work/life balance of Trump staffers: “Never-at-rest social media have blurred the line between work hours and private time. Cellphone cameras make it ever easier to intrude and broadcast.” Those who run the Trump administration, the paper suggests, deserve to be able to clock out after a hard day of sending migrant children to internment camps. The civility fetish, to borrow a phrase from Nima Shirazi and Adam Johnson (Citations Needed, 6/13/18), narrows the horizons of resistance—for example, the academic Steven Salaita was fired for opposing Israel’s massive 2014 assault on Gaza with “uncivil” tweets. By suggesting that it’s going too far to mildly inconvenience people who propagate transphobia and carry out what the UN describes as an “unlawful,” “serious violation” of the rights of children, the Post is delegitimizing efforts to stop such measures. The civility shibboleth requires a radical relativism in which virtually all political perspectives and actions are equally valid—provided they aren’t too threatening to the status quo—and it’s effectively impossible to reach a judgment about any of them. Both the editorial and Abernathy’s column serve up the same ludicrous comparison between opposing the Trump government’s transphobia and racism and supporting women’s rights to choose to have an abortion—comparisons that wrongly imply that attacks on people providing abortion services is a hypothetical, even though considerable violence of this type, including bombings and assassination, has taken place, sometimes with the encouragement of prominent media figures (Media Beat, 8/3/94; Salon, 5/31/09). Those who are insisting that we are in a special moment justifying incivility should think for a moment how many Americans might find their own special moment. How hard is it to imagine, for example, people who strongly believe that abortion is murder deciding that judges or other officials who protect abortion rights should not be able to live peaceably with their families? with respect, even though their politics, lies and defense of the indefensible, as perceived locally, are as loathsome to most people here as Nielsen and Sanders supposedly are to those who forced their exits. Yes, who’s to say whether allowing a woman to control her body is any better than jailing children and forbidding them to hug one another? Because the civility fetish entails fatuously pretending that almost every political position that doesn’t challenge entrenched power is legitimate, it is demobilizing—one cannot act against injustice without parsing justice from injustice—at a moment when mobilization is badly needed. Because the Post has sanctified civility, small departures from its codes seem dangerous. Thus the paper misses an important angle to the story, namely that Trump’s officials have encountered an astonishingly small amount of pushback to this point, and that this lack of resistance is the real danger facing the United States and the rest of the world.